You are currently browsing the category archive for the ‘rotten boroughs’ category. 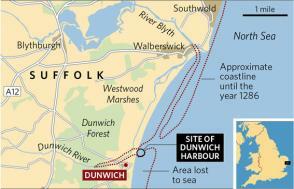 Here’s a fascinating story from The Independent about the Suffolk coastal city of Dunwich, which has disappeared beneath the waves of the North Atlantic. The city of Dunwich had several thousand inhabitants at the time of the Domesday Book (William the Conqueror‘s systematic census of the entire realm of England – conducted for taxation purposes!). It went into decline in the 14th century and was almost completely abandoned by 1750. The town had been important enough to be granted two members of the House of Commons in 1295. The population was down to 12 by 1800 and on election day the voters got into a boat and rowed out to the spot where the town square used to be! Dunwich is a classic example of a “rotten borough” abolished by the Reform Act of 1832. The political corruption caused by the “rotten boroughs” is one of the reasons why the authors of the US Constitution called for a census and reapportionment of the House of Representatives every ten years. But I digress. Dunwich as an archeological site promises to yield an interesting picture of medieval life – if the difficulties of diving in the murky waters of the north Atlantic can be overcome. This British Atlantis – with its eight churches, five houses of religious orders, three chapels and two hospitals – is now about to be exposed to human gaze for the first time since the first of a series of great storms and sea surges hit the East Anglian coast in 1286 and began the process of coastal erosion which led to the city’s disappearance.